We started our Hayduke hike about 1.5 miles south of Moab airport after hitching out north from Moab on Highway 191. 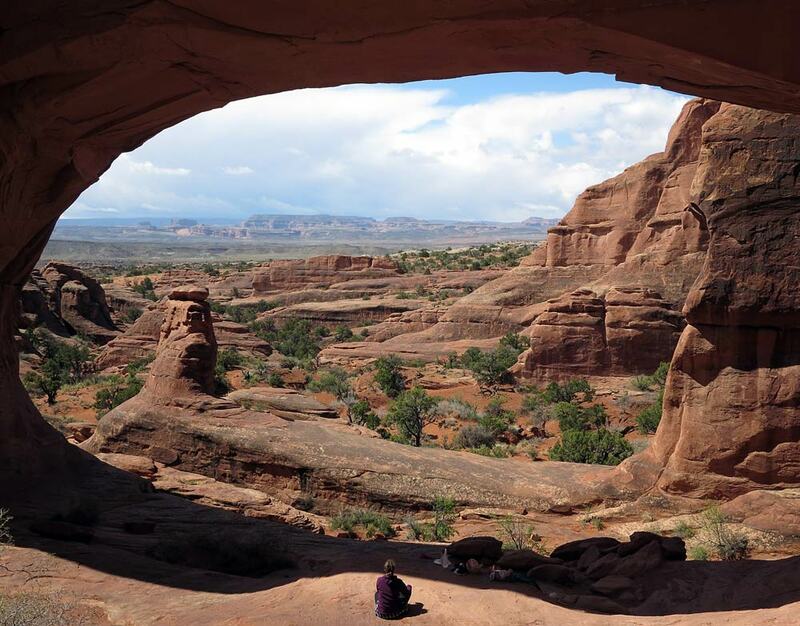 We did a number of alternatives to the guidebook route to maximize the great Arches scenery. This is a short section (we spread it over 2.5 days but it could be done in less) so you can travel light and step gently into the Hayduke! 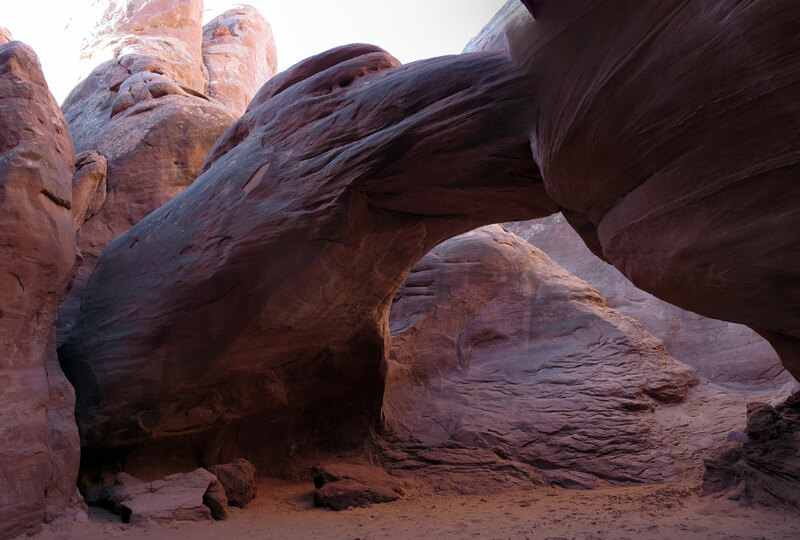 •	Best of all you have an interesting varied start with dirt road, slick rock, cross country and the superb Tower Arch. Buck 30 described this in 2013 There is a dirt track 1.5 miles south of the airport signposted Klondyke Bluffs. Hike the dirt road to the bluffs mountain bike trailhead then head NE cross country up over broken slick rock to the edge of Arches NP and ½ mile further to Tower Arch Road. Turn left on the sandy winding dirt road to near Tower Arch. A small diversion on trail takes you under the arch which is one of the best around (see pic). We followed the excellent Tower Arch Trail past the Marching Men to pick up the Tower Arch Trailhead road and followed it NE then E to the main Salt Valley dirt road (and the actual Hayduke at Section 1|2.0). See some not to be missed classic, unique Arches scenery for a small extra diversion. Also pass 2 good secure water faucet sources at Devil’s Garden Trailhead and campground. Section 1|2.0 From the Hayduke Salt Valley junction we then headed NE again on the Devil’s Garden alternate mapped by Andrew Skurka and Li Brannfors. There is some cross country and we had a short 30 foot scramble to climb the top cliff band to reach the tower of Dark Angel. We then followed good trail SE down to 'Double O' Arch. The standard Devil’s Garden trail mapped by Skurka/Li is good but busy and a highway. We chose to take the slightly longer (maybe 1/2 an hour) Primitive Loop Trail from here which heads in a loop north then back round to join the main trail. This has some cool slick rock scrambling and fins and is again recommended. Another cool short loop with two good arches. If you stay in the campground then you might as well do this one as you are right on it. Note that the campground appears to book out for the season- right through summer! As a way round this you could ask someone to share their site or stealth camp somewhere out the way. From the Devil’s Garden TH hike along tarmac to the campground. The Broken Arch loop heads NE from here and is easy to follow. We split south to Sand Dune Arch, back west to the park road then cut cross country west to pick up the dirt track on the Skurka/Li mapped alternate leading down to Salt Valley. We then followed the pipeline south west down into Salt Valley then up over a broad ridge to Arches NP west border and the Hayduke Trail again (Section 1|8.1)! This is pretty easy going with wide spacious views. The guidebook route south following the fenceline is straightforward to the sandstone fins at Hayduke Section 1|9.0. 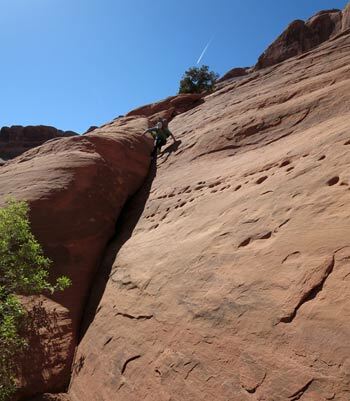 There is a little fun scrambling here to drop down into the scoop on slickrock. Section 1|10.6 Willows Spring wash. We found water with a good trickling flow and pools here (although we had just had heavy rain the night before). 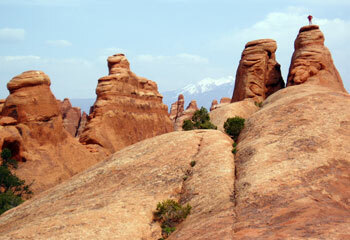 We then followed pleasant washes down to another alternate from Nicolas C. Barth called Arches Slickrock. Cool cross country over slickrock away from upper Courthouse Wash with nice views across to the La Sal Mountains. It does have some ‘tricky’ scrambling down slickrock though! We only followed the first half of the alternate down to the park road, then crossed the road and continued down Courthouse Wash on the guidebook route. This gave us the advantage of a water source to camp beside and lower Courthouse Wash is rather laid back and provides easy hiking down to the bridge over the Colorado River near Moab. Section 1|11.0 approx. Leave the wash where it bends south west and follow a south easterly line over excellent slickrock plateau with spacious views all round. The traverse along the top of the Great Wall north east then south west is grand. We found the descent down had a couple of short slabby tricky sections though. It would probably be easier going up than down (eastbound on the Hayduke). With two people we made it down without too much trouble although we used our emergency 2mm cord to lower the backpacks. The lower corner is pictured here which was the easier of the two scrambles and brings you to the bottom of the cliff. Once down just follow the washes into the main Courthouse Wash and the Hayduke roughly at Section 1|16.8. Lower Courthouse Wash was mellow and enjoyable with lots of water and even beaver signs. We didn’t have any trouble finding a way down with just a little willow bushwhacking here and there.